I resisted writing this column initially since the Crusades are the stuff of epics, long books, magnificent movies, and hardly can be encompassed within the confines of a weekly column. Much ink has been spilt recently about the Crusades, set off by the barbarity of the radical Islamicists beheading people and burning prisoners alive. Then President Obama weighed in, casually noting that Christians should not get on their high horse of morality when Christian warriors in the past, and he threw in the Inquisition, were pretty barbaric themselves during the Crusades, thereby setting off the usual firestorm of criticism in the overheated political environment of today. So, what were the Crusades? You can Wikipedia or Google the Crusades and get all you need. Here’s the abridged special from the course on the history of the Christian church that I’ve taught over the years. 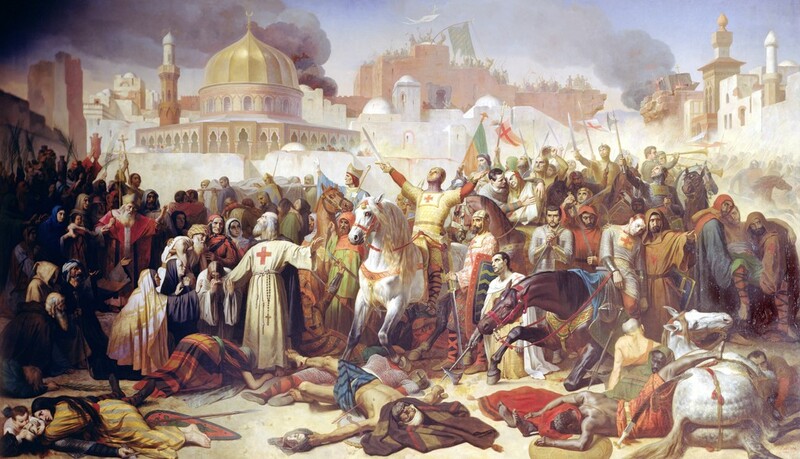 The first crusade was called for by Pope Urban II in 1095 to send Christian warriors to the Holy Land to restore access for Christian pilgrims to many of the sites associated with Jesus Christ and the rise of Christianity. Pilgrimages to Palestine and especially of course to Jerusalem had long been popular with the devout of Europe. Even in our day and age, Christians make the trek to Israel to walk the Via Dolorosa that Christ walked to be crucified on Golgotha, or visit the Sea of Galilee, or celebrate Christmas in Bethlehem. The rise of Islam in the Arabian Peninsula in the seventh century eventually spread over the Middle East and included Jerusalem. Towards the middle and second half of the eleventh century, Saracens began to block and hinder Christians from visiting Jerusalem. The story is long and complicated, but European Christians of the Middle Ages determined to break these blockades and the Crusades were on. There were seven Crusades in the almost three centuries following Pope Urban II’s call to arms. Jerusalem was captured twice by the Crusaders, and held for many years as a Christian bastion in the face of generally hostile Islamic tribes and peoples. Atrocities and acts of mercy and compassion and incredible bravery marked the Crusades. At stake was not merely access and control of the holy sites of Christendom, but also Europe’s very Christian being. Turks and other Islamic peoples had invaded Europe almost regularly over the centuries preceding the Crusades. St. Peter’s in Rome was sacked in 841 a.d. and Rome itself was besieged by Saracens several times since then. Sicily was taken by Saracens but recaptured by Christian Norman knights in battles stretching across the eleventh century. Why even make such a big deal of pilgrimages and visiting “holy” places? To most Christians, Christianity is about things of the spirit, the indwelling of the Holy Spirit in you, and listening and acting on his counsel. But places have always been important in our lives. We are in fact related to the past, and to the events of our faith, by actual events and actual places. To touch them, to see them, to sense the eternal power exercised or expressed in those places, it touches your soul as well as your mind. Why do you visit the grave of a loved one? It is not a macabre or useless exercise in nostalgia and dead dreams and hopes, but to remember the eternal and the good in the past. As early as the times of the Emperor Constantine (272-337 a.d.), his mother Helena made her way to Jerusalem to seek out the cross, literally (to employ a much overused word today). She found three crosses, and determined the one which held the crucified Jesus, and built the church over the site of the tomb. And she brought some relics back to Rome with her. You skeptics might ask—with some reason—did she really find the true cross, the real tomb, actual relics, and so forth. Doubters did not detract from the beliefs of pilgrims who flocked to the Holy Land, making dangerous voyages, traveling through inhospitable lands and people, to get to Jerusalem and touch the places that held so many memories of their Lord and Savior. Even healings and miracles were attributed to these places and holy relics, and so, over the centuries, thousands and thousands of the pious embarked on the long and dangerous pilgrimage. When they returned, they persuaded others, by the tales and wonders they experienced, to embark on the same pilgrimage until near the end of the eleventh century when Saracens started to block their way in serious fashions. And so the First Crusade was preached in 1095, and in July, 1099 Jerusalem fell to the Christian Crusaders, led by some of the greatest French Christian nobles and knights, like Godfrey of Bouillon. When offered to be named king of the city late in July, Godfrey refused the honor, saying it would dishonor his Lord to wear a crown of gold where Jesus wore a crown of thorns. This column published Sunday March 1, 2015 in the OpEd section of The Tuscaloosa News as Crusaders’ Aim Was to Retake the Holy Land. I love your columns! I enjoyed this one especially. Keep up the great writing. thanks. much appreciated. i like writing them!